Bugaboo generously provided this cute Halloween Brat Dracula image which I colored with Copics. I used a Gina Marie Designs set of stitched square dies to make the squares, using pumpkin pie and SU! Halloween dsp. The background is also SU! Halloween dsp. I added a "Boo" sentiment to the image panel with a stick stamp by Judith and die cut the panel with a Lil Inker stitched rectangle die. Thanks for stopping by and we look forward to seeing the wonderful cards you make with this fun sketch! Have a great Tuesday! Great paper choices to go with this beautifully coloured Dracula, a Great card Carol. Such a cute little Dracula! Going to have to think on this sketch! Very cute image! I have a bunc of the bugaboo digis and now I have a new printer, so hopefully I will be able to use them. Fun sketch, it is a good thing you had the dies to make it a bit easier. TFS! 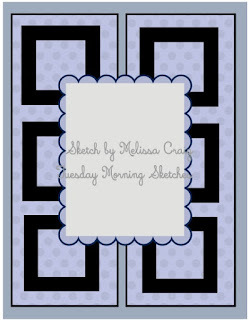 A super card Carol, a fun image and fabulous papers - a great sketch. I like this with the stitched squares and fun image. Great interpretation of the sketch Carol, and this cutie is adorable... too much adorable to spooky LOL :D Fabulous card! Your little card is adorable. That Brat Dracula is too darn cute. I LUV how you tied the background paper to your image and the squares are perfection. This card is top notch in all aspects! Really cute little Dracula (I don't like the scary ones!) colored most beautifully. Love the sketch and your interpretation of it. Of course I love the stitched squares that make up the background over that delightful batty Halloween paper. My kind of Halloween card. TFS & Big hugs to you both. You rocked this sketch!! Love the colors/papers you choose. Your coloring is perfect for this little guy. 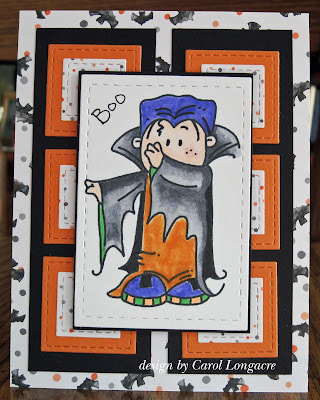 Super cute card - I love the stitched squares and you colored up that dracula so adorably well.